We have an idea. 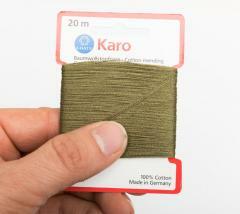 Instead of throwing worn quality socks & other clothes away, why not just fix them? This German army patching thread will provide you 20 metres of extended life for your garments. Save many a buck by spending just one! These come in two flavours. The green thread is probably meant for general repairs, being quite thin but not as coarse as regular sewing thread - this has the benefit of the repaired spot not causing discomfort. It's made of 100% cotton and might work as sock darning thread too. The gray thread is sort of a special thread; not as thin as regular thread, not as thick as the stuff grandma makes wool socks from. 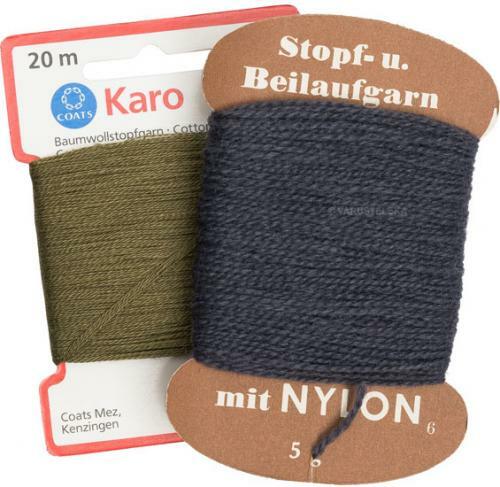 It's perfect for repairing almost any sock ja most other woollen/acrylic clothes too. Made of cotton with nylon. This is fine, as the patch area is usually quite small and cotton/nylon stands up to use better than wool. One cardinal sin is the rate people go through especially socks - even quality ones. You can save money and do something generally useful by just patching them up for a second round of use. Here's how it's done (there probably are other ways too). Darning socks is a relatively simple task. You need a ball-like thing to put inside the sock to keep it in form, and a needle with a large eye. Take an approx. suitable length of thread and run it through the eye. Now do a little knot somewhere near the hole and stitch around the hole like you would be framing it. When finished, start weaving the thread like prison bars across the hole, forth and back until it's covered in one direction. Now do the same starting from a different direction, over and under, forth and back, creating a criss-cross weave pattern over the hole. If you want to, you can always do this one more time for an even stronger repair but bear in mind that it might get very thick. When finished, run the thread somewhere and lock it in place so it won't fray. Of course it's wise to act even before there is a real hole. With minor modifications works for sweaters and such too. And of course in unissued condition. High quality stuff and for cheap too! Uh yeah, it's thread, it's nice and comfortable for darning with (I purchased both kinds); I don't really know what else there is to say about this. Very strong. Very cheap. Buy. 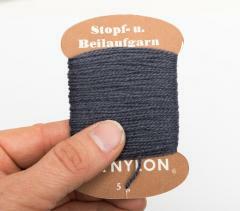 Pleased I ordered this when I bought a Swiss Woollen pullover, as the cuff needed darning! Good quality thread, very reasonable price. 'Nuff said, go buy!